Redania’s Most Wanted is none other than Philippa Eilhart, one time leader of the Lodge of Sorceresses, blinded by mad king Radovid for her crimes. At the end of Get Junior, King Radovid of Redania calls in his favour, asking you to find – and preferably kill – the sorceress Philippa Eilhart. Undertaking this quest does not necessitate killing Philippa, so go with a light heart. Along with An Eye for An Eye, A Deadly Plot and Reason of State, it is part of a group of quests collectively labelled Assassin in our walkthrough. These quests have an important effect on which ending you see, and should not be undertaken – or ignored – lightly. Travel to Est Taylar and chat with the unpleasant Witch Hunters at the entrance. Once they give you the key, drop down into the crack (aim for the little ledge closest to the Witch Hunters rather than falling in the opposite side). Before you proceed, turn right and grab the Witcher Gear diagrams from the hidden nook opposite the door to Philippa’s lair. Proceed into the hideout and you’ll meet a locked door. Backtrack a little and use Witcher Sense to examine the ivy covered wall near the entrance, uncovering the lock. Use it to open up the gate. Continue on until you reach a junction with an active portal on the left and an inactive portal on the right. Pass through the active portal. You can find an owl feather here – evidence of Philippa, who favours this form. Head down the nearby stairs, dispatching a couple of Nekkers, to reach another inactive portal. You can fire this one up – just use Aard on the dead crystal to re-energise it. Head on through. The next room is host to a lost Witch Hunter. He won’t take your advice and leave, nor hand over the crystal he’s clutching, so you’ll have to either use Axii level two on him or beat him up to get it. When you’re done, take a look around – there’s another feather and a chest with some love letters. When you’re ready, put the crystal in the socket near the inactive portal and energise it with Aard. Step through. You’ll be ambushed by several Nekkers. When they’re down, check out the paths out of this area and go the “wrong way” first, away from the indicated search area and through a rocky tunnel to the southeast. Battle a bunch of Nekkers and grab the crystal waiting in the dark. Return to the main room and take the other path, socketing and activating your newfound crystal and passing through the portal it produces. In this large new room, you’ll emerge on one of two symmetrical staircases. The portal on the other side is inactive; run through it and go behind the one you appeared from to grab some loot. When you’re back around the front of the second portal, switch it on, opening a shortcut back to your base. In the centre of this room you’ll have to fight a Fire Elemental, so prepare accordingly before venturing any further in. When it’s down, don’t rush for the stairs leading forward just yet – search the borders of the area carefully for a number of good loot chests. Here’s the rest of the Novigrad secondary quests. 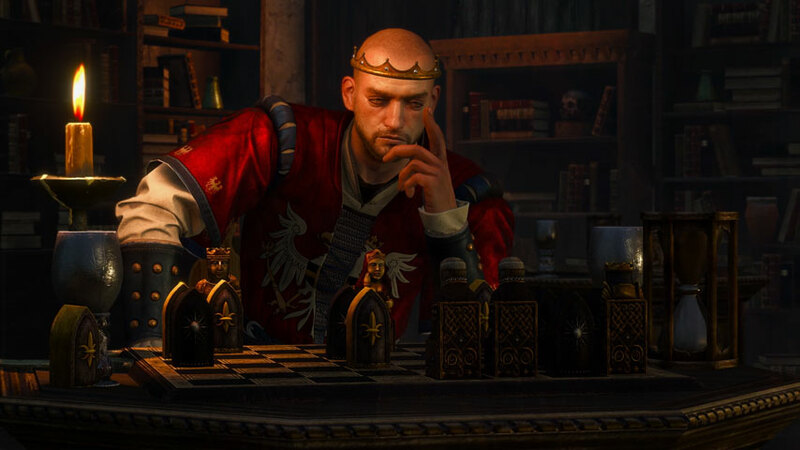 Be sure to bookmark our The Witcher 3 guide and walkthrough. Climb up the stairs and proceed down the tunnel to reach Philippa’s laboratory at least. There are several things of interest here, so check them all out. Your goal is a Megascope crystal lying on the floor; it’s quite difficult to see. Apply Hanged Man’s Venom to your Steel Blade and return to the entrance, taking the shortcut we opened earlier. The Witch Hunters confront you. Whether you intend to side with the sorceresses or not, do not hand over the crystal when they ask you too – they take all the credit and reward for your hard work. Fight them all instead. Maybe kick their bodies a bit. It’s not listed as a quest objective, but you can elect to study the crystal before delivering it to Radovid. Visit Triss in Novigrad (only available before the events of Now or Never) or Yennefer in Skellige (she’s usually found in her room at the inn in Kaer Trolde harbour) to learn more about Philippa’s plans and possible whereabouts. If either sorceress is away awaiting your input on a quest, you may have to complete that quest to speak to them on this matter. You can elect to hand the crystal over to them, or take it away with you. There are no consequences to this action. Return to Radovid to report on your findings. You can give him the crystal for a monetary reward, or just provide information to receive nothing at all. There are no consequences to this action.